Here, you learn ten cool shortcuts that can help you handle Project 2016 like a pro. You’ll become so adept at using Project 2016 that your fingers will seem to fly over the keyboard. 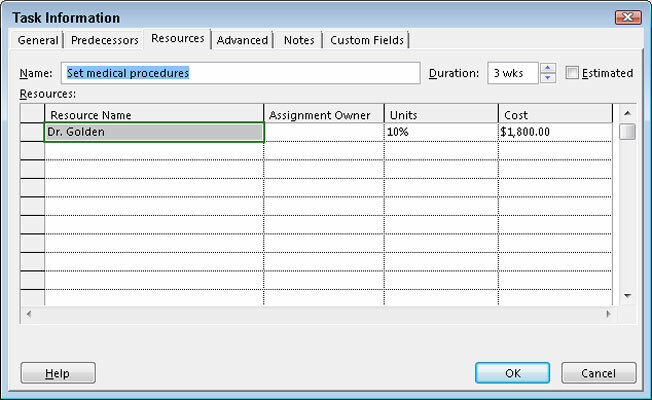 From Gantt Chart view, you can double-click any task in the project to open the Task Information dialog box. 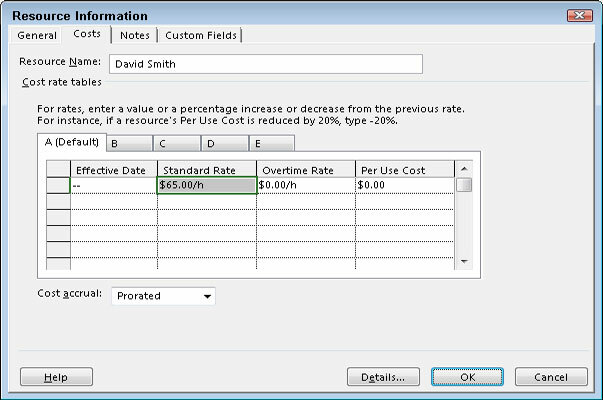 You can then use it to enter or modify durations, predecessor information, resources, notes, task types, and constraints. If you want to know anything about a resource, you can find the information in the Resource Information dialog box. From any Resource Sheet view, double-click a resource name to see contact information, availability, cost rates, and any notes you’ve entered about the resource. You can use the Resource Information dialog box to enter, edit, or update resource information for people, supplies, equipment, and locations considered to be resources. When the Assign Resources dialog box is open, double-click a resource name to display the Resource Information dialog box. Most user actions in Project are fairly standard, so you shouldn’t have to visit the Ribbon every time you want to give a command. Instead, you can simply right-click a task to display a floating menu of options that let you (for example) cut, copy, and paste text; insert and delete tasks; assign resources; navigate to the Task Information dialog box; add notes; and add the task to the timeline. Sometimes, you need to see portions of the project expanded to show all tasks in detail while other portions remain rolled up to a summary task level. In addition to the standard method of clicking the triangle next to the summary task to expand or summarize tasks, you can use keystrokes. To hide a subtask, press Alt+Shift+hyphen (–). To show subtasks, press Alt+Shift+plus sign (+). 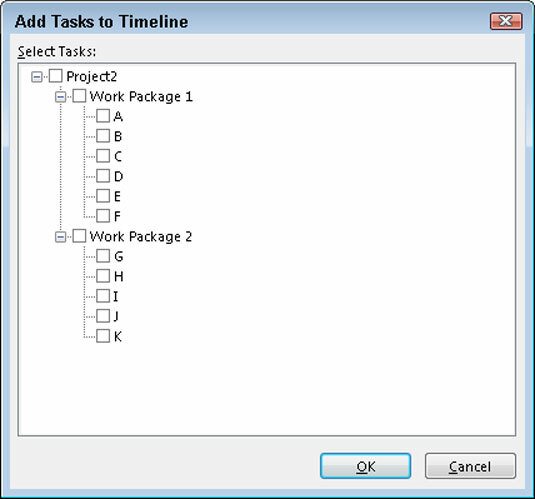 The work breakdown structure (WBS) lets you show the parent-child relationship in a task by indenting its subtasks to create the outline (the WBS) of the project. Instead of selecting all the tasks you want to work with and then indenting or outdenting them from the Ribbon, you can select them and then press Alt+Shift+right arrow to indent them. To outdent a task, press Alt+Shift+left arrow. Suppose that all the tasks in a series have the same resource or the same duration. 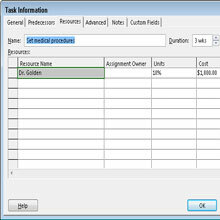 Rather than repeatedly enter the same resource or duration, you can enter the duration on the topmost task in the list, select the rest of the tasks, and then press Ctrl+D. Project “fills down” the resource to the rest of the selected tasks. The Alt key is a helpful tool for navigating to the beginning or end of the project. Simply press Ctrl+Home to move to the beginning of the project or press Ctrl+End to move to the end. You can also press the Alt key to navigate around the timescale. To move to the right (forward in time), press Alt+right arrow. To move to the left (backward in time), press Alt+left arrow. Sometimes, you want to see the big-picture view of the project by viewing the timescale at the level of months and years. At other times, you need to see details about when tasks will occur. In Project, you can set the timescale to show time in years, all the way down to hours. To show incrementally larger timescale units, press Ctrl+/ (slash). To show smaller, more detailed timescale units, press Ctrl+Shift+* (asterisk). Even the Timeline has shortcuts. When you first show the Timeline, it displays the text Add tasks with dates to the timeline. 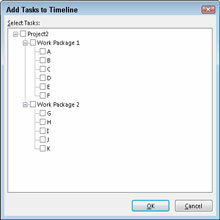 Double-click the text to open the Add Tasks to Timeline dialog box. Every task is accompanied by a check box; simply select the ones you want to show on the Timeline. Double-clicking the initial text to open the Add Tasks to Timeline dialog box only works the first time you open the Timeline. After you begin entering information on the Timeline, the text that appears on it the first time you open it disappears, and you have to enter tasks by right-clicking them first and choosing Add to Timeline from the shortcut menu. To find information quickly within the project, press Ctrl+F to open the Quick Find dialog box. Then type the word you want to find in the Find What box.